This beautiful three bedroom, two and a half bath golf course house overlooks the sixteenth fairway and green of one of two golf courses on this 6000 acre private island off the coast of Beaufort, SC. Fourteen years ago we purchased the house and completely renovated and redecorated it with new carpeting, paint, furniture, appliances ,kitchen items and linens. We visit it often, and every year we continue to improve it for you and for us to enjoy. Recently, we removed the carpeting and installed hardwood floors in the entire house except the bedrooms. We completely remodeled the master bath area. It is now tiled with a walk in shower, a new vanity, mirrors, lighting, etc. This past year we tore out the old, cracked and buckled asphalt driveway and installed pavers for the driveway and walkway. Hurricane Matthew completely destroyed the garden in our courtyard, so we have replanted it with some new and interesting plantings and we also installed a jerry-rigged automatic sprinkling system to assure that the garden gets adequate moisture during these first few months. Because we are Fripp Island Club members, our guests can enjoy the fine recreational facilities and programs available on Fripp Island. Privately owned, with access restricted to preserve the high standards you expect, the Fripp Island sports and dining amenities are designed to provide unparalleled satisfaction. You may purchase up to six amenity cards. Each card is $50 per week from Memorial Day to Labor Day or $35 during the off season. We have installed wifi and an HDTV for the living room. Two bedrooms have their own standard cable connected televisions. The televisions are connected to Comcast/XFinity with HBO and Showtime and several other premium networks. Additionally, the house offers free North American long distance calling. Two of the bedrooms have queen size beds, and the third has two twins. Among the other amenities you will find, we include two bicycles to help you explore our wonderful island. Although we have tried to think of everything to make your stay more enjoyable, we welcome any suggestions you may have to make your next stay with us more enjoyable. Fripp Island is a private gated island off the coast of one of South Carolina’s most historic cities. The island features two championship golf courses, a tennis center, a beach club, numerous swimming pools with adjacent poolside bars, a marina, several restaurants, abundant wildlife, woods, marsh boardwalks and miles and miles of walkable beaches and nature trails. Included with your rental is the right of access to all of Fripp’s natural wonders. The house has 1550 square feet of room plus a comfortably sized deck. The kitchen is large enough for more than one person to work in comfortably and has a small breakfast nook. The living room and the master bedroom have ten foot cathedral ceilings. Sitting on the deck, you may watch golfers or white tail deer work their way along the championship course, wave to Al, one of the alligators who resides in the lagoon across the fairway and occasionally look off to your left for a glimpse of the ocean at the inlet between Fripp Island and the neighboring Hunting Island. The ocean inlet is approximately 400 yards away. The nearest beach is a leisurely stroll of about 800 yards. Our home is filled with light and features casual, comfortable furniture, beach books and inviting spots for reading, and jigsaw puzzles. The living area's large, open floor plan allows the cooks among you to prepare a meal without missing the card game at the dining room table or the conversation in the living room. Amenities: When you arrive, you'll find the beds all made up for you with towels and toiletries in each bathroom. Not your basic rental. Our home is a home-away-from home with a large well-equipped kitchen, with three TVs. The one in the living room is HD. with a VCR and a DVD player. The house also features wifi, a fireplace, air conditioning, cable television, coffee maker, large comfortable deck, dishwasher, washing machine, dryer, full kitchen, microwave, telephone with free calling throughout North America, two bicycles and a large charcoal kettle grill for grilling out. A POST SCRIPT: Choosing a vacation home sight-unseen is always a challenge. We know because we did it too, every summer for 30 years. But more and more we kept coming back to Fripp Island. It suited our life style. Our goal is to help you decide if our home is right for you. So please don't hesitate to ask questions. This is not a holiday home but a home filled with love and feelings that it belongs to someone. We have stayed at many places in the USA, but this is the best. A great vacation. Perhaps our home will be right for you. We wish we could extend our invitation to your pets, we love our pets and always wanted to take ours along. But we have put a lot of work, love and money into making our home inviting and comfortable for us and our guests and we are concerned that ordinarily well mannered pets get nervous in new surroundings and accidents happen. So we have to ask that you not bring your pets. We also insist that you not smoke in our home. We had been renting at Fripp for nearly 30 years. In 2003 we saw this house, fell in love with it, bought it and have been working on making it perfect ever since. We wanted a free standing house large enough to accomodate our small family, with a view of the water on the golf course. We had stayed at some of the Fairway Club homes in the past and really loved them. When we saw this house, we decided to not miss the opportunity. Every day the deer walk by. We're on a first name basis with some of them! We have a pond across the fairway with wonderful ocean birds (including a bald eagle who comes by to fish once in a while), a few alligators, jumping fish and one of the world's great frog choruses. They would take their singing on tour, but they don't want to leave Fripp. Four hundred yards up the fairway, we can see the ocean where it comes into the inlet between Fripp and Hunting Island. Within a couple of hundred yards, the Audubon Club maintains a nature trail on the edge of one of the marshes. 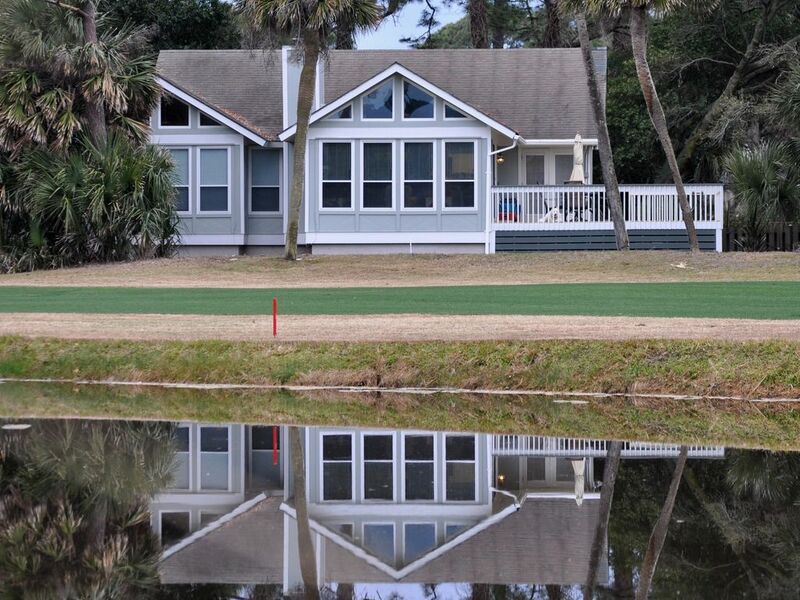 Fripp is a gated community which is in many ways similar to a private country club. It features two championship golf courses, tennis courts and numerous swimming pools. 16th fairway on the Ocean Point course, right next to the green. Nice view of the ocean about 400 yards straight down the fairway. Free local and nationwide calling. International travelers, including Canadian, should use calling cards or cell phones. High efficiency washing machine. Please use only HE detergent. Wi-Fi through password protected modem. A fitness facility is available near the beach club (requires amenity card for use). Ten foot cathedral ceiling facing golf course, and pond with view of distant ocean. Eighteen cubic feet with ice-maker. Glass top with self-cleaning oven. Fully stocked with enough dishes and utensils to easily accommodate a full house of six. The kitchen is well equipped. All appliances are new since 2010. Six foot long dining table in spacious (15 x 15 foot dining room. Three televisions including one HD. DirecTv and Century Link broadband and phone service. There are a number of various kinds of books. We left some to begin with and have invited guests to borrow and leave books. Mostly classical with some pop and jazz CDs. A few, mostly children's DVDs. The backyard is a golf course. Over 300 sf. Great view of golf course and a view of the ocean 400 yards away. Private courtyard with patio. The living level is approximately 4 feet above ground level, and the interior doors are not wide enough to accommodate a wheelchair. We really enjoyed our stay. We would highly recommend this home for your vacation. Loved watching the deer and the alligator. Perfect Get-away For A Girlfriend's Trip to Fripp! Our girl's beach trip to Fripp Island was perfect in every way. The weather cooperated and the house was perfect for our 4 night stay. The deck was the best part of the house...we spent a lot of time out there, admiring the beautiful view of the 16th hole of the golf course, the landscaping, the ocean view, which is distant, but still in sight and we especially enjoyed the many deer, who visited us every evening. The house was very clean, very comfortable and fully equipped. Thank you to Rick and Peggy Ward, who own this wonderful get-away house on Fripp Island. We will return! I honestly cannot say enough good things about this house and the owners. This house is the perfect size for a small family or couple. It is very clean and the owners communicate very well. It includes everything you could possibly need including a view of the ocean and fairway. Already making plans to go back for a third stay next year! Thank you for your kind words and such a great review. As one of our favorites, you will be very welcome on your return, and you will still be paying 2017 prices. We have tried to hold the prices for people who return year after year. We have some long term guests who are paying $300 less than our current rate because of coming back every year. Also, thank you for pointing out that we try very hard to be available in case of questions or concerns. About the only time that you won't be able to reach one of us is during church. Great stay, great place wonderful accommodation s.
Owners were great to work with. After nearly 30 years of staying in rental units that were poorly prepared for guests to live in the unit for a week or more, a priority for our vacation home was that it be comfortable, well lighted, well equipped and that we be responsive to our guests needs. I think we have succeeded. All season long, our guests have given us five star reviews lauding the beauty and comfort of our home, how well it is equipped and the ease of getting in contact with us if there are questions or concerns. When we treat our guests right, they treat us right. They treat our house with respect, they leave it in great shape. Thank you. We hope to see you back next year. The house was very inviting and beautiful. We had everything we needed and it truly felt like home away from home.. Thank you for sharing your home with our family. We had a fantastic time. Our family found this house to have everything we needed. It was nicely decorated, clean and very welcoming. We felt right at home! Enjoyed watching the birds, the herds of deer, the enormous alligator, the double-rainbows, the stars, the ocean, and the golfers (some good, some not so good...a couple of balls came close to the house!) all from the back deck. It was relaxing and enjoyable. The owners are absolutely wonderful to deal with always communicating quickly. We would highly recommend this rental. Golf cart rental for $267.50 per week including taxes. Amenity cards available. Rates are subject to change until reservation is confirmed.